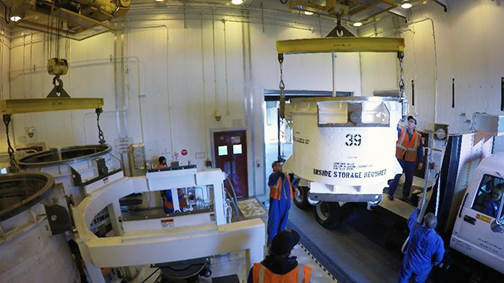 Northrop Grumman has successfully completed casting, or filling with propellant, the first live motor segment for the company's new OmegA rocket — the segment, developed as a part of the company’s Common Boost Segment (CBS) program, is specifically designed to support the needs of this new intermediate to heavy-lift rocket. This cast of a C600 rocket motor required a record 55 mixes of propellant that are 600-gallons each. Photo is courtesy of Northrop Grumman. OmegA supports Northrop Grumman’s initiative to develop a rocket in compliance with the U.S. Air Force Evolved Expendable Launch Vehicle (EELV) competition that will launch intermediate to heavy-class national security payloads. As a key initiative for the company, Northrop Grumman is committed to ensuring the OmegA program meets major milestones, such as this cast. 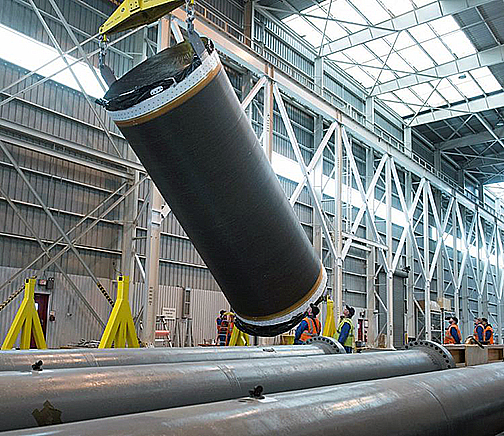 The casting of this aft motor segment, the CASTOR® 600 (C600), follows the completion of an inert cast in April, which marked the largest solid rocket motor casting campaign in Northrop Grumman history. The inert cast enabled the team to uncover any potential process issues early on, assuring that this live cast would go smoothly. The C600 aft segment is the heaviest of any of the CBS motor segments. This cast required a record fill of 33,000 gallons of propellant. For comparison purposes, the second-heaviest Promontory-cast rocket motor segment is a NASA Space Launch System booster forward segment requiring 27,000 gallons of propellant. The C600 aft segment is the heaviest of any of the CBS motor segments. Photo is courtesy of Northrop Grumman. Over the last three years the company has been on schedule and within budget while making outstanding progress on the CBS design and initial test and verification hardware. The first static test for the program is a C600, consisting of a forward and an aft segment mated together, and the second is a C300, which is a single segment motor. Planned for 2019, these two tests will verify the first and second stage performance for OmegA’s intermediate vehicle configuration, which will make up the majority of the anticipated flights beginning in 2021. Charlie Precourt, VP and GM, propulsion systems, Northrop Grumman, said that the company's team succeeded beautifully in meeting this important milestone for the firm's OmegA rocket. There are two more live motor casts and the company will be ready for ground tests next year.